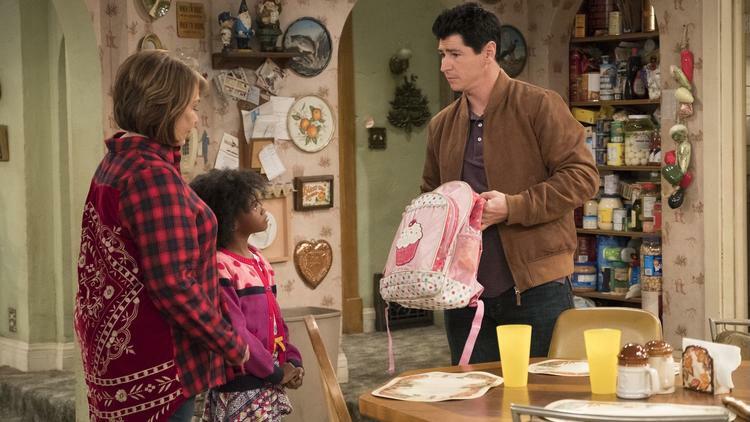 Michael Fishman was coaching softball with plans of eventually returning to television full time when Sara Gilbert asked if he was interested in reuniting with their “Roseanne” co-stars. It had been about two decades since Fishman played troublemaking teen D.J. Conner on the ABC series. Fishman said he and “Roseanne” co-creator/star Roseanne Barr kept in touch over the years and discussed where they thought his character would end up. D.J. Conner recently left the Army, and his post-military life will be further explored on an episode scheduled to air at 7 p.m. Tuesday. Geena (played by Jahmela Biggs) will be introduced as Conner’s wife, who is stationed in Afghanistan. Fishman said some fans were “taken aback” that Conner — who was uncomfortable kissing Geena in a school play in 1994 because she’s black — is in an interracial marriage. The couple has a daughter, Mary (Jayden Rey). “Roseanne” is set in the fictional Illinois town of Lanford, which is supposed to be located near Elgin. Some of the show’s stars have ties to the area — Laurie Metcalf (Jackie) is a Steppenwolf Theatre original member, Johnny Galecki (David) spent part of his childhood in Oak Park and Lecy Goranson (Becky) is an Evanston native. Fishman said the cast visited Elgin a few times during the original run of the series, which first aired from 1988-1997. He said he hasn’t been back to the city this time around, but the show’s writers have studied how the region has changed in the last 20 years. “We really care for fans that they can relate to the show, and not just fans here in the Chicago area, but also all over the Midwest and kind of all over the country. There’s a little bit of a universalness to the show, but there also is a very authentic Midwestern feel,” Fishman said. The revival seems to resonate with Middle America, especially in the Chicago area. More than 18 million viewers tuned in March 27 for the premiere (not including the millions who watched via DVR). Chicago was the No. 5 market, behind Tulsa, Cincinnati, Kansas City and Pittsburgh, respectively, according to Nielsen Media numbers. President Donald Trump called Barr to congratulate her on the “huge” ratings for the premiere, which delved into the blue-collar TV family’s political divide. Barr is a vocal supporter of Trump both on and off screen. Metcalf plays Roseanne’s pussyhat-wearing sister. Though “Roseanne” hasn’t been able to sustain its premiere numbers — last week’s episode drew more than 10 million viewers, the show has already been renewed for an 11th season. Production is expected to begin near the end of summer.